Nick Bjugstad has been a monster in 2011-12 for the Minnesota Golden Gophers. The 6-foot-5, 211-pound centerman has ripped his competition to shreds in his sophomore season and shows no signs of slowing. The way this kid has played has got to leave the USA Hockey brass salivating. Bjugstad is tied for the NCAA lead with 25 points including a national-best 15 goals for the resurgent Golden Gophers. In just 16 games, he’s already eclipsed his freshman point total (20 in 29 GP). In addition to Bjugstad’s offensive prowess, he’s getting the job done at the dot. He has taken 53 more draws than his closest teammate, Erik Haula. Going to the circle 291 times, Bjugstad has won 54 percent of his faceoffs. There’s also Bjugstad’s effectiveness on the Gopher power play. His 10 power-play points are third on the squad, but he’s converted on 22 percent of the shots he’s taken with the extra space. Special teams are vital to success at the WJC. Having someone that you can count on to bury on the PP is crucial. 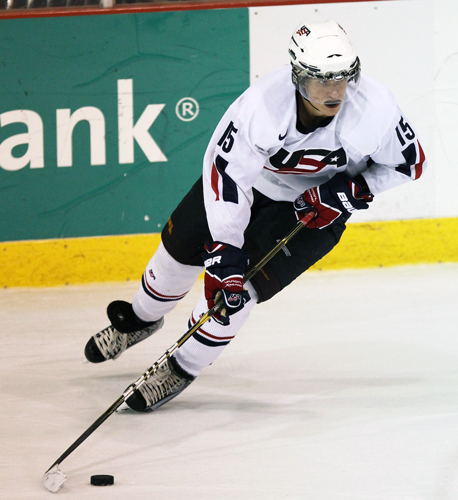 There is little question Bjugstad will be a top-two centerman for Team USA, if not the first-liner. He’s a WJC veteran and will be counted on more heavily in his second time around. His size, his ability and his production are about as good as any of the Team USA candidates. Bjugstad will have to deal with that added responsibility in his second U.S. stint. There’s going to be more expected of him. As an 18-year-old on last year’s squad, Bjugstad posted four points in six games, including the OT game-winner against Finland in the preliminary round and the GWG in the bronze-medal game. Along with WHL superstud, Emerson Etem, Bjugstad has to bring the offense and prove when the going gets tough, he just gets tougher. He’s too big to do anything other than physically dominate his competition, and has proven he can do it at the college level this year. There’s no reason to think he can’t at least double his point production from the 2011 WJC. This off-season did wonders for Bjugstad. He put on some weight and certainly looks like a sure-fire elite prospect. As long as he’s mentally prepared for this event, he should be one of Team USA’s top performers. There’s no question he’s got the game to make it happen. His size and talent will be particularly necessary in the New Year’s Eve match-up against Canada. There’s a very good chance there will be a bye to the semis on the line in that game, as there has often been in the past. It’s the perfect stage for Bjugstad to show the world what the people in Minnesota already know. He’s a big-time player. – Prior to heading the the U, played at Blaine H.S. – Went 18-0 in doubles for his high school’s tennis team, but missed the sectional playoffs for the NHL Scouting Combine. Several times per week, until the U.S. National Junior Team’s pre-tournament camp roster is announced, The United States of Hockey will highlight a candidate for the team. We’ll be taking a look at players from the near locks to the dark-horse candidates to the out-of-left-field possibilities. This entry was posted in American Prospects, NCAA, U.S. National Teams, USA Hockey, World Junior Championship. Bookmark the permalink. Nick accelerated his high school studies. His final year of high school was his junior year.